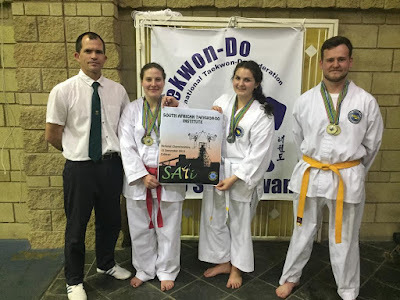 I'm happy to share the results of the Soo Shim Kwan Potchefstroom Taekwon-Do Club's recent participation at the National Championships of the South Africa Taekwon-Do Institute (SATI), which was held at Cullinan, Gauteng, South Africa. Three students participated in the national champs, and all of them brought home multiple medals. Riana Serfontein earned a silver medal for patterns in the adult female intermediate division, as well as a silver medal for sparring in the adult female intermediate division. Riana also went on to tie for first place in the adult female power breaking division. Edrich Louw earned a gold for both patterns and sparring in the adult male novice divisions. And, Hilda Schutte got silver medals for patterns and sparring in the adult female novice divisions. I'd like to congratulate these three Taekwon-Do practitioners on their stellar performances. The Soo Shim Kwan Potchefstroom Taekwon-Do Club has never been a big club and only a few students participate in the annual national championships, but they always do us very proud. 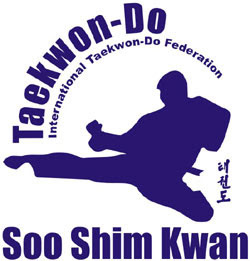 This year the Soo Shim Kwan Potchefstroom Taekwon-Do Club is 20 years old (one of the oldest continuously running Taekwon-Do clubs in South Africa), and is still an authentically traditional ITF Taekwon-Do school with a strong technical focus, that I'm very proud of being a part of. A particular congratulations goes to Instructor Philip de Vos of the Potchefstroom Taekwon-Do Club for the fantastic work he is doing and for the achievement of his students.